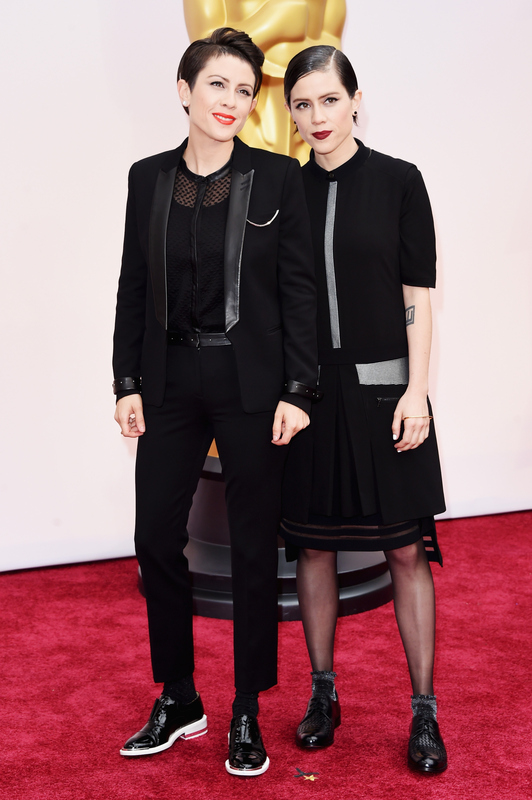 Tegan and Sara kind of have an ideal situation going on when it comes to choosing an Oscar date: They always have each other, obvs. This phenomenon makes it easy to dress for a common theme, which they totally did tonight. The twins made a perfectly charming pair on the Academy Awards red carpet. Okay, more than charming — they were stunning! My jaw [literally] dropped when I saw them make their entrance: They looked incredible in all black whilst rocking the flapper goth trend that I predicted would become "a thing" toward the end of last year. The two played off each other's aesthetic: Matte black, androgynous menswear accented by sheen gunmetal and silvery details. Sara paired a boxy cut skirt with a sheer hemline and collared skirt with a pair Jagger Weave Oxfords from Cole Haan’s Fall 14 collection. Her slicked-down bob and smoky eyes in combo with that dark lip were absolute goth babe perfection: I'm swooning. Tegan, the other Quinn sister, looked equally amazing in her modern black tuxedo and white-soled, creeper-esque ankle boots. Although donning a lighter hair and makeup look, her classic red lip was totally on point. The pair will perform their nominated song "Everything is Awesome!!!" from The Lego Movie on the stage tonight, so here's to them sounding as good as they look (and to seeing more flapper goth on that red carpet).